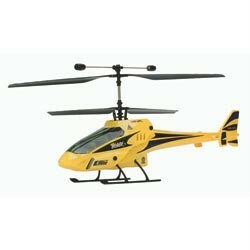 Here you have an E-Flite Blade CX Electric Helicopter !! This package will include the Heli outfitted with the Brand New Standard CX Yellow Body Style or the Police Blue Body Style, Your Choice, a new set of crystals ($15.00 value), Instructional CD, and Owners Manual !! You can use your own crystals, or simply change out the ones in your radio and 4 & 1 with the included set, and you have another heli ready to fly without all the other expensive un-neccesary items that come with the whole package. Please understand that this package includes the complete ready to fly E-Flite Blade CX Heli, a set of E-flite Crystals, owners manual, Instructional CD, and original protective storage box. No Transmitter, battery, or charger. Why bother with buying all the other items? This way you can fly two heli's with one radio !! While one is out of commission needing repairs, you have an identical spare !! Never miss out on flying time again. You can't go wrong here when you have a Low Purchase Price Of Only $79.00, You Have Your Choice of the Yellow Or Blue Body Style and if you buy now you can receive it in just a "few days" !!! These Heli's are no longer available NEW or seperate like this, and this is a Limited Time Offer, so choose your color and buy now or loose out ! !